At this time of year our thoughts are on ghosts and goblins and things that go bump in the night. Bad luck and superstition has followed Hollywood and those who lived and worked there long before the film people arrived. A house that had its share of bad luck and tragedy was built on the northeast corner of Hollywood Boulevard and Fuller Street more than 100 years ago. Gossip columnist, Louella Parsons, called the home that once stood at 7269 Hollywood Boulevard, “the jinx mansion.” Over the twenty-five years of its existence, it was home to a grocery store founder, a meat packing heir and a Hollywood film producer and his movie star wife. All experienced misfortune and heartbreak during their stay there. The builder and first resident of the “jinx mansion” was George A. Ralphs, the founder of Ralph’s grocery store, the largest food retailer in Southern California. Every Angelino has shopped at a Ralphs at one time or another. George Albert Ralphs was born in Joplin, Missouri, in 1850. His family moved to California on a prairie schooner and a yoke of oxen when he was a boy. In Kansas, they joined a caravan and upon reaching Colorado, they were attacked by Indians. Half of the caravan became separated in the fight and no word was ever heard from them again. It was presumed that they were massacred. The remaining caravan arrived in Los Angeles after eighteen months of travel. Once he was settled, George Ralphs was trained as an expert bricklayer. After losing an arm in an accident, he gave up bricklaying and found work as a clerk in a small grocery store. In 1873, he had saved enough money to purchase his own grocery at Sixth and Spring Streets. From then on, Ralphs prospered, operating three of the largest stores in Los Angeles. In 1897, Ralphs married Wallula von Keith and together they had two children: Albert and Annabel. 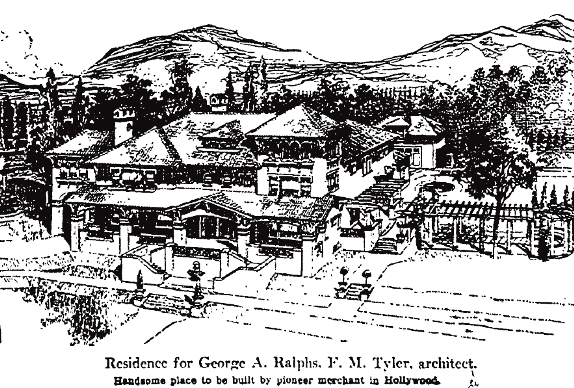 In May 1913, Ralphs began construction on a new house on a three-acre lot in Hollywood that he reportedly bought from George Dunlap, the town’s second mayor. Located on the north side of Hollywood Boulevard at Fuller Street, architect Frank M. Tyler designed the Mission Revival house at a cost of $35,000. With a plastered exterior and a red clay tile roof, the house had sixteen rooms with three baths. The interior was richly furnished in oak and mahogany; onyx and tile mantels adorned the fireplaces. There was a tennis court on the property, and a swimming pool which was emptied often to water the citrus orchards. 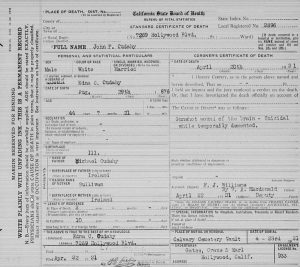 On June 21, 1914, a few months after moving into the house, Ralphs took his family for a week-end outing to the San Bernardino Mountains near Lake Arrowhead. He had just gone up Waterman’s Canyon with his wife and children for an early morning stroll and, having walked a little faster than the others, sat on a boulder to wait for them to catch up. As his wife approached, he moved over to allow her sit beside him when the boulder, weighing about three tons, gave way and rolled twenty feet down the canyon, carrying Ralphs with it. His leg was caught beneath the boulder and nearly torn from the socket. He was rushed to the Ramona Hospital (now Community Hospital of San Bernardino) where his leg was amputated. Ralphs came out of the anesthetic shortly after, and talked to his wife for a few minutes but he went into shock. 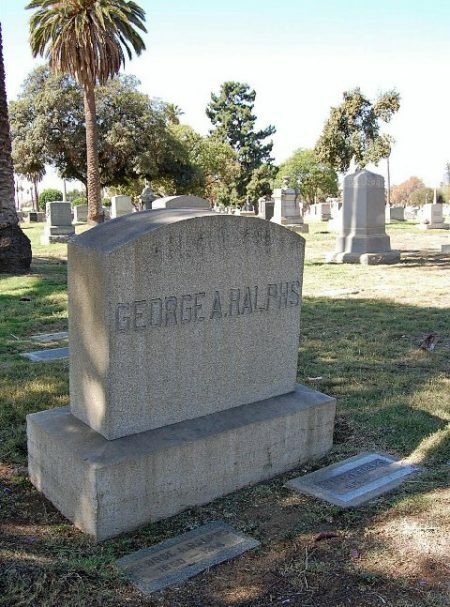 George Ralphs died within the hour at 4:15 o’clock that afternoon. Ralphs body was returned to his home in Hollywood where funeral services were held. The Ralphs grocery stores were closed that day in memory of their founder. After the service, Ralphs was buried in Evergreen Cemetery. 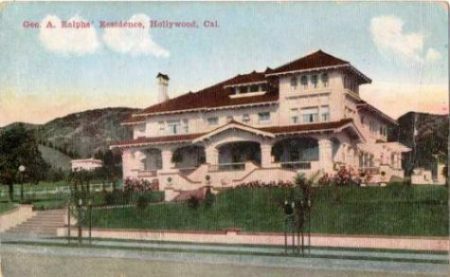 Mrs. Ralphs remained in the Hollywood mansion for several years, sometimes living there, and at other times, renting it out to such well-known residents as Mira Hershey, owner of the Hollywood Hotel and to actor Douglas Fairbanks. On August 20, 1918, Mrs. Ralphs hosted a political garden party in honor of California Governor, William D. Stephens and as a fund raiser for the war effort. In 1920, Mrs. Ralphs leased the mansion to John “Jack” P. Cudahy, the son of the millionaire meat-packer, Michael Cudahy. The town of Cudahy, California which is east of Los Angeles, was named for the family. In 1899, Jack Cudahy married Edna Cowin, daughter of General John Clay Cowin of Omaha. They had four children, Edna, Marie, Anne and Michael. For a time, Cudahy was general manager of his father’s packing plant in Kansas City. While there, he and his wife became estranged after Cudahy attacked Jere Lillis, the president of the Western Exchange Bank, who he suspected of having an affair with his wife. They were divorced, but reconciled two years later and were remarried, living in Pasadena, California. Cudahy, however, had his problems. In 1914, he was sued for $30,000 in damages after throwing a doctor’s wife against a table. After a stint in the army, Cudahy was given a medical discharge following a nervous breakdown. In 1919, he was sued by the Hotel Maryland for failure to pay a two-year hotel bill amounting to almost $10,000. Shortly after moving into the Ralphs mansion, Cudahy was under a doctor’s care for an extremely nervous condition and for insomnia. In early April 1921, he disappeared for ten days and it was later learned that he had been living at the Rosslyn Hotel under a fictitious name. Previous to that he had spent three months in a sanatorium. The following morning, at about 10:30am, Cudahy went into his bathroom, retrieved his Winchester shotgun which he used for trap-shooting, and went to his bedroom. Edna claimed that he did not seem to be unusually despondent. At exactly 11:45am, Edna was in her dressing room when she heard a gun shot and rushed into her husband’s bedroom where she found him dead. He had committed suicide by blowing off the top of his head. 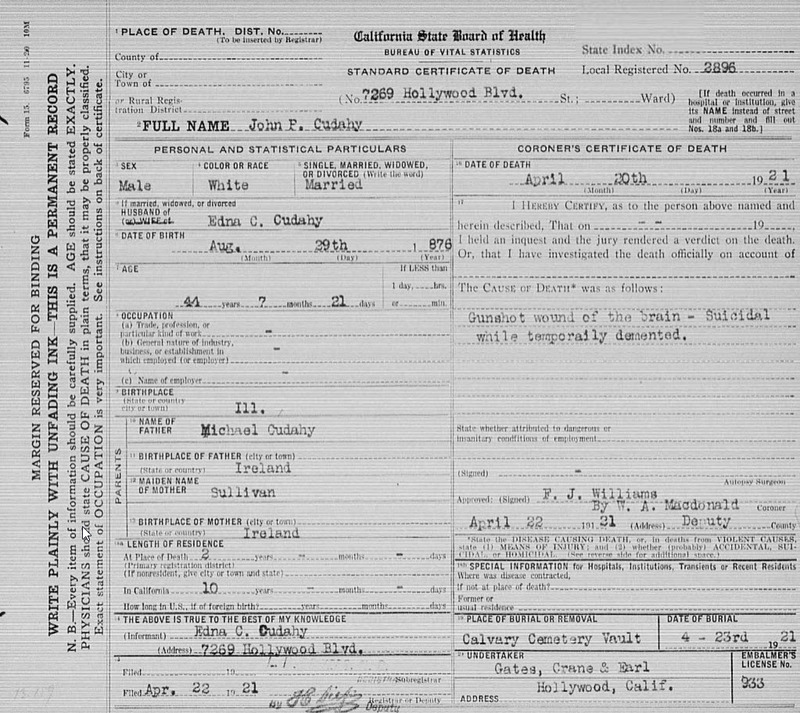 John Cudahy was buried at Calvary Cemetery in East Los Angeles. Edna and her children moved out of the house shortly after her husband’s suicide. Thirteen years later she was living in a mansion near Vine Street and Franklin Avenue in Hollywood. Actor Lou Tellegen, who had fallen on hard times, was living with her and committed suicide in his bathroom by stabbing himself in his heart seven times with a pair of scissors. After Cudahy’s suicide, the mansion stood empty for about a year. 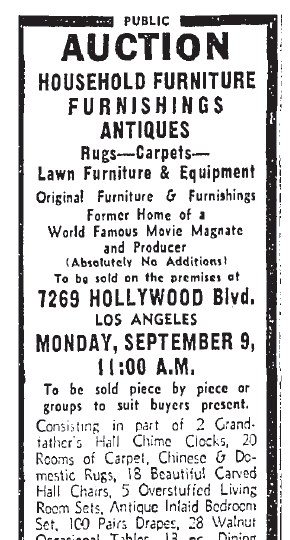 In October 1922, Mrs. Ralphs sold the house and property to a local realty company for $150,000. They planned to demolish the house and build a 350 room apartment hotel at a cost of one million dollars. For unknown reasons, the hotel was never built and the mansion was spared. 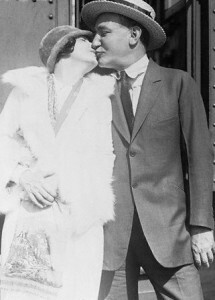 Film producer, Joseph M. Schenck and his wife, actress Norma Talmadge, were the next owners of the “jinx mansion.” The Schenck’s, who were married in 1916, probably moved into the house in late 1922 or early 1923. For the first few years their lives were routine, at least for film people, with the exception of several break-ins in which Norma’s jewelry was stolen. Gradually, the couple began to grow apart. 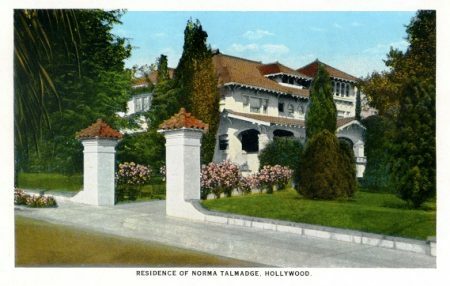 They separated in 1927 and moved into separate residences; Norma to an elegant West Hollywood apartment building on Harper Avenue, and Schenck moved to a large house in Beverly Hills. They remained married, however, and kept ownership of the Hollywood Boulevard mansion. In July 1930, Talmadge traveled to Europe for a rest amid rumors that they were getting divorced but the couple denied the rumors, each claiming they were still in love. The following year, Talmadge asked for a divorce and Schenck agreed but she never filed for it. In 1932, she asked again for a divorce and traveled to Europe, supposedly to get one, but once there, she denied the so-called rumors. 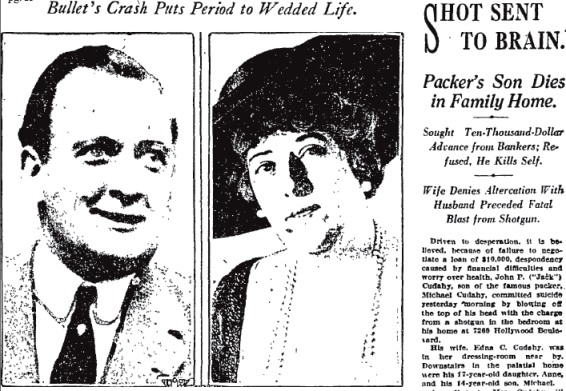 During 1932 alone, the Schenck divorce rumors were many and were announced and denied several times. In the meantime, she had an affair with comedian George Jessel until finally, in April 1934, Talmadge and Schenck were divorced in Juarez, Mexico. Three weeks later Norma married Jessel. During all of this, the Schenck’s kept the mansion, and may have rented it out but Schenck reportedly moved back after the divorce. In May 1936, Schenck redecorated the property, adding a two-story cabana and a 60-foot swimming pool that replaced the one installed by the Ralphs, which was filled in by the Cudahy’s. Bad luck continued to follow Schenck. In 1936, he agreed to pay a bribe to avoid strikes with the unions, but because he made the payoff with a personal check, it came to the attention of the IRS and he was eventually convicted of income tax evasion. 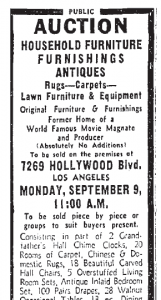 In 1940, he finally sold the Hollywood Boulevard “jinx mansion” and all its furnishings in an auction, supposedly to help pay his legal fees. In 1946, Schenck spent time in prison before being granted a pardon by President Harry Truman. 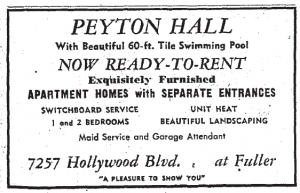 After Schenck sold the mansion, it was razed to make way for Peyton Hall, the first apartment house to go up on Hollywood Boulevard west of La Brea. The colonial-style garden apartment complex included more than 70 apartments. A red carpet rolled all the way from the grand portico to Hollywood Boulevard. There were discreet private entrances and a loudspeaker on the grounds that summoned stars to the studios. The architect and builders kept the 60-foot swimming pool that Joseph Schenck installed four years earlier and it was used by the residents, including Shelley Winters and Johnny Weissmuller, who once jumped from the roof into the deep end. 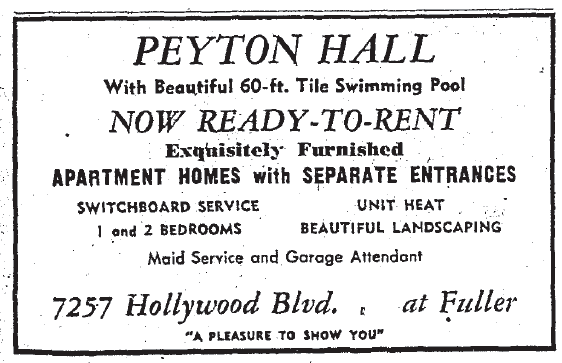 Other celebrity residents at Peyton Hall included Susan Hayward, George Raft and Janet Gaynor. 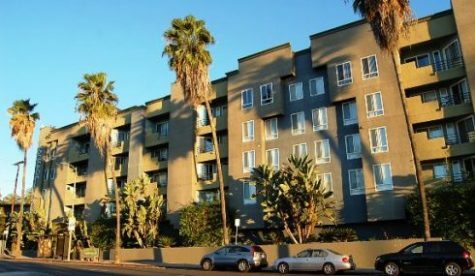 Cary Grant stayed there during World War II and Claudette Colbert actually owned the complex and sold it in 1946 for about $450,000 to the first of a succession of owners. In 1960, an investment group bought it for $790,000. “I moved into Peyton Hall in 1976. Living there were Richard Guthrie (Days of our Lives), Dave Fleisher (brother of Max-both of Popeye cartoon fame), McLean Stevenson (M*A*S*H), Herman Hover (who had managed Ciro’s), Timothy Patrick Murphy (actor), and Bill Miller (the first Brad in the Rocky Horror Picture Show at the Roxy on Sunset. “We loved Peyton Hall. I lived in 3 units. 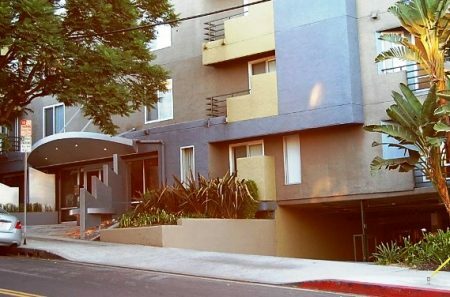 A bachelor (just a room w/a bathroom), a studio apartment (with a full kitchen & great stainless steel counters), and a one bedroom-all at 7243 Hollywood Blvd. “The long pool was amazing (next to the old maids quarters)… Four lanes with hand laid Italian tiles. There was a HUGE old carriage house that we used for parking. You entered from Fuller Street, and also some covered parking near the pool. The movie Eating Raoul was filmed in apartments there. “We went on a rent strike for 2 years, to try and save the building. We all deposited our rent into a bank account, and tried our best to lobby the city council to give Peyton Hall a landmark status. But, the land was bought by investors from Taiwan and we were all evicted. They gave us around $1,000 each, and three months to get out. Beginning in 1978, preservationists waged a two-year battle to save the landmark complex –but to no avail. Peyton Hall was demolished in the early 1980s and the recently renamed, Vantage Apartments (formerly the Serravella) was built in 1988 and remains there today. 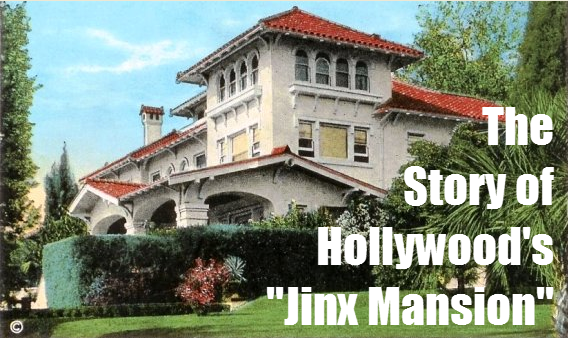 Whether you believe in the “jinx mansion” or not is up to the reader—but it makes an interesting story. If you happen be in the neighborhood of the 7200 block of Hollywood Boulevard on Halloween night, do so at your own risk.